Connecting your Icom radios to your computer has never been easier! Just $59 plus shipping! Now connecting your Icom radios to your computer has never been easier! 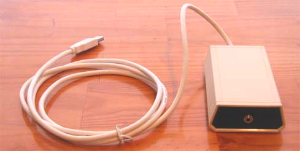 The USB CI-V Interface plugs into the USB port of a Windows, Macintosh or Linux computer, allowing an Icom radio (or other radios with a CI-V interface) to be connected and controlled via the CI-V (CIV) protocol. An attached 6 ft USB cable plugs into a standard USB port on your computer. One standard 1/8" cable to connect to your radio's CI-V port is included. The interface acts like a standard serial port, so it works with all radio control programs. Note that it does not control the PTT line or pass audio. The USB Icom CI-V Interface is powered off the USB bus, no external power is required. If your radio is not listed, but it has a CI-V interface, it will work with that radio. Please check the manual for your radio to make sure that it has a CI-V port, and whether or not you need any special wiring. The USB CI-V Interface comes with cables designed to work with a STANDARD CI-V port. Note that some radios, such as the Icom R-20, have a special CI-V jack that also has audio. You'll need to make a special cable for such radios, to only pass the ground and CI-V signal, and not the audio. Included drivers (for Windows 8 / 7 / Vista / XP and Macintosh MacOS 8.6-9.2 and Mac OS X 10.2 or later) create an emulated serial port (COM1-COM8 for Windows, Communications Toolbox compatible for Macintosh) that allow any well behaved application to use the USB Icom CI-V Interface as though it was a normal serial port. This means it works with virtually any software program. Linux users may wish to look at these notes for use under linux. No other software is included with the unit, but most if not all existing Icom control programs should work with the USB Icom Interface CI-V, as it appears as a normal serial port. See the bottom of this page for links to some programs. The USB CI-V Interface is only $59.00 plus $10.00 shipping within the USA. Due to the extremely high cost of overseas shipping, we only ship within the USA. You can also mail your order with payment by check or money order, print and fill out the mail order form. We offer a simple program called BCSIcom which can let you test out your USB CI-V link. It polls the radio to display the frequency and mode, and lets you set them as well. It is not a full featured radio control program, but it is handy to check out that the basic hardware, USB CI-V Interface, and drivers all work. Dog Park Software has several excellent logging, memory management, and satellite tracking programs, all for the Macintosh. Thanks for a great product, you saved me about $80 with your product for my ICOM-706MKIIG, very easy hookup, about 2 min. Louis Taylor - KD6SBR "Tom"